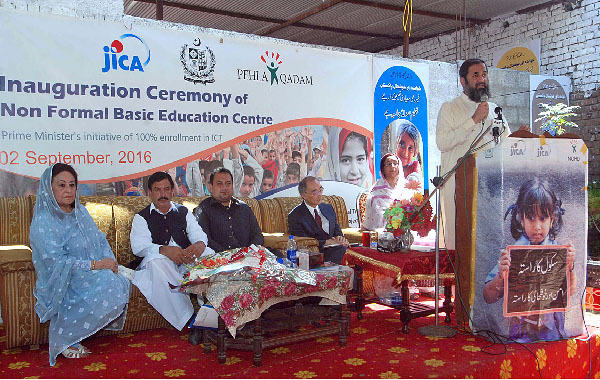 ISLAMABAD, Sep 2 (APP): State Minister for Higher Education and Professional Training Engineer Muhammad Baligh ur Rehman on Friday inaugurated a Non-Formal Basic Community School at Saray Kharbooza Islamabad. This Primary school was set up with the collaboration of National Commission for Human Development (NCHD) and Japan International Cooperation Agency (JICA) aiming 100 percent enrollment of students in Islamabad Capital Territory. Speaking on the occasion the minister said the present government had enhanced 100 percent education budget during three years. He added that education is a basic tool for progress of any society, adding that unfortunately they have not attained that standard in the country yet and millions of children are still out of school. Baligh said 50 Non Formal Basic Education center would be set up in the capital for ensuring educational facilities for children at their nearby areas. He said the government was working on curriculum and invited all provinces to come forward with their recommendations for establishing single syllabus for all. There is a proposal for including translation of Holy Quran in the syllabus of class six to higher secondary, he informed. The minister stated that adult literacy centres would also be established in the capital, besides training women in vocational skills. “Out of schools children is a national loss for our country”, he said adding that “they are focusing to make ICT schools a model for other academic institutions with upgrading them on modern lines”. The minister further commented that education with moral training is imperative for every child as they are our national asset and future of this country. The chairperson of NCHD former Senator Razina Alam Khan said healthy and ideal conflict free society is possible only by achieving 100% literacy rate. She said unfortunately previous government did not give importance to the education that is why our literacy rate is lowest in the region what to talk of the world. She said public sector and international donors are jointly working to eradicate illiteracy for the country and we foresee better future of our generations. Chairperson said, that NCHD had launched this initiative with the aim to materialize collaborative efforts of the partners in strengthening non-formal education systems at national level through non-formal education policy, non-formal education management information system and quality aspects that comprises curriculum, learning materials, and assessment and accreditation systems along with operationalizing the inter-provincial coordination forum for non-formal education. Ministry of Federal Education and Professional Training, Academy of Education Planning and Management and Japan International Cooperation Agency -Advancing Quality Alternative Learning Project are all partners in this project. She said our aim is to enhance literacy rate of Islamabad from 88% to 100% this non-formal school at Sarai Kharbooza is a step towards that direction.